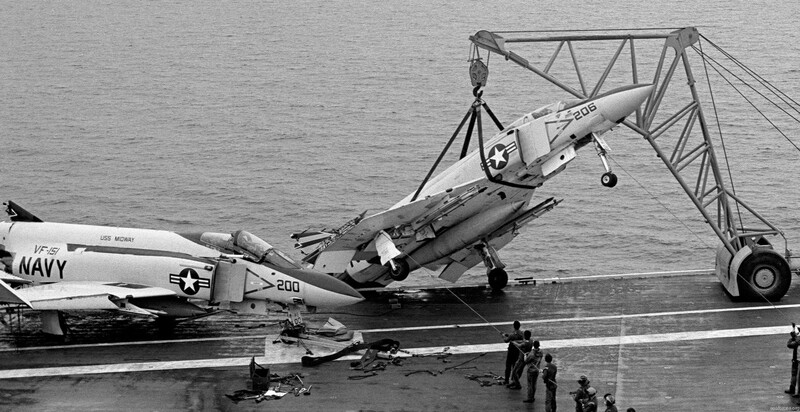 crewmen work to recover a damaged McDonnell Douglas F-4J Phantom II of Fighter Squadron VF-151 "Vigilantes" hanging off the side of the ship. Four distinct U.S. Navy squadrons have been designated VF-151. The first was established, and then disestablished, in 1945. The second was established at VF-153 in 1945 and eventually became VFA-192. The third was originally established as VF-65 in 1951. This squadron was eventually disestablished as VA-23 in 1970. The fourth squadron to be designated VF-151 was established as VF-23 in 1948, eventually became VFA-151, and is the main subject of this article. The Squadron was originally established as Fighter Squadron 23 (VF-23) at Naval Air Station Oceana, Virginia On August 6, 1948. The squadron was attached to Air Group Two aboard the USS Midway (CV-41) and flew the F4U-5 Corsair and F6F-5P Hellcat. By April 1949, the squadron flew the F4U-4 Corsair exclusively, embarking with that aircraft for a Mediterranean Sea Deployment from May-Dec 1949. In August 1950, the squadron moved to NAS Alameda, California, and then deployed for the first of three cruises in support of the Korean War. On 15 Sep 1950, the squadron flew combat missions from USS Boxer (CV-21) in support of the amphibious landings at Inchon, Korea. Upon their return to the States, the squadron relocated to NAS Moffett Field in Nov 1950. The squadron transitioned to the jet age in Jan 1951, flying the straight-wing F9F-2 Panther on their second Korea deployment from USS Princeton (CV-37). During the third Korean War deployment, while flying from USS Essex (CV-9) In Aug 1952, squadron aircraft participated in joint operations with the U.S. Air Force, striking targets in Pyongyang and the surrounding area. The squadron transitioned to the F2H-3 Banshee in March 1953 and adopted a new role as an all-weather fighter squadron. In Mar 1954, the squadron was deployed to the western Pacific aboard Essex when the carrier was ordered to operate off the coast of Vietnam during the Viet Minh’s assault against the French at Dien Bien Phu. In Dec 1956, VF-23 transitioned to the F4D-1 Skyray, and in Aug and Sep 1958, the squadron flew sorties from USS Yorktown (CV-10) in the Taiwan Straits after the Chinese Communists bombarded Quemoy Island. VF-23 deployed to the WestPac aboard USS Hancock (CV-19) in 1958 and again 1959. 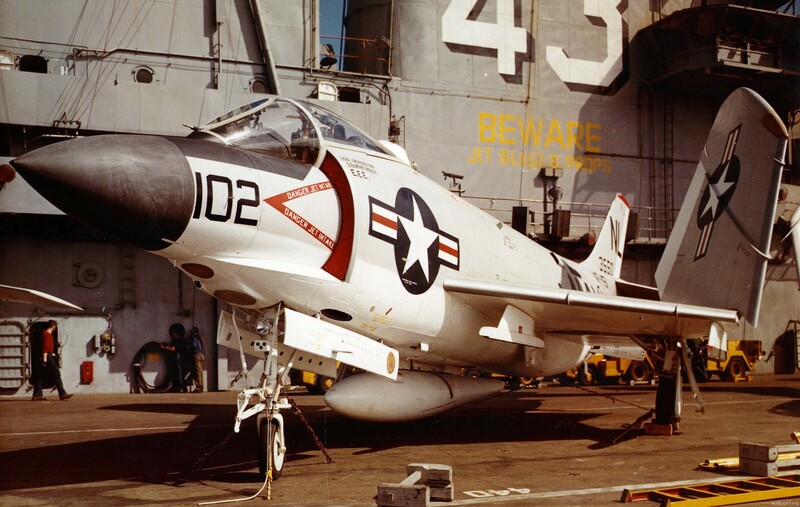 The squadron, now known as the Vigilantes, transitioned to the F3H-2 Demon in Jan 1959. 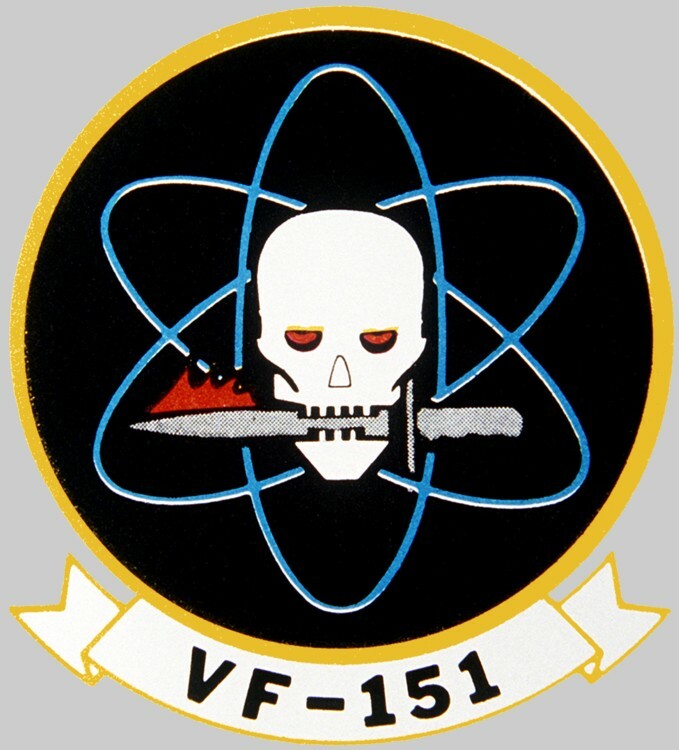 A month later, the squadron was redesignated Fighter Squadron ONE HUNDRED FIFTY ONE (VF-151) on 23 February 1959 and assigned to Carrier Air Group 15. In Jul 1961, the squadron moved homeports to NAS Miramar and made the first of three WestPac deployments aboard USS Coral Sea (CV-43). In Jan 1964, the squadron transitioned to the two-seat F-4B Phantom and deployed for its first Vietnam War cruise on 7 Dec 1964. During the eleven month combat deployment, the squadron flew nearly 1500 combat sorties, including support of the 1965 Operation Rolling Thunder bombing campaign against military targets in North Vietnam. The Vigilantes returned to Southeast Asia on their second Vietnam deployment in December 1966 aboard USS Constellation (CV-64). 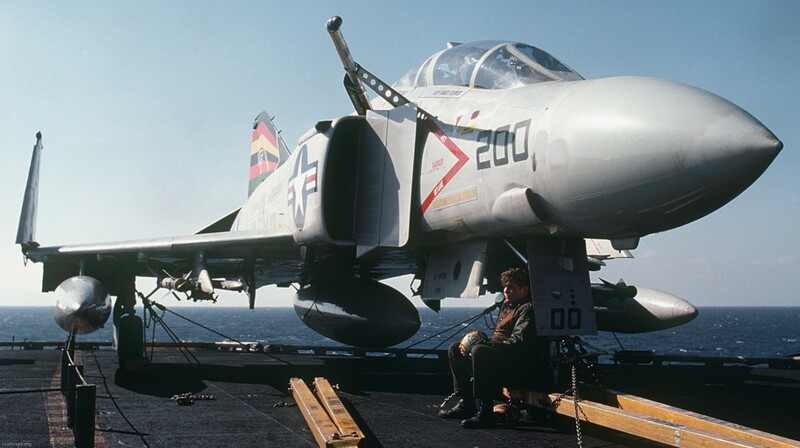 The squadron made its third deployment of the war aboard USS Coral Sea from July 1967 to April 1968. On October 24, 1967 the squadron's commanding officer, CDR C.R. Gillespie, and his RIO, LTJG R.C. Clark, were shot down by a surface-to-air missile over North Vietnam. 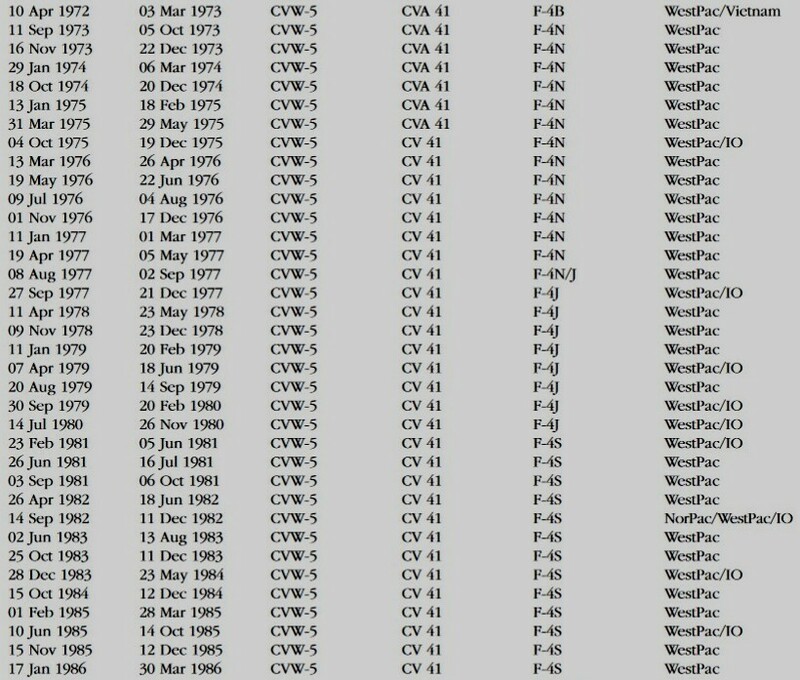 CDR Gillespie became a POW and was not released until May 1973. LTJG Clark died in captivity. In Mar 1968, Coral Sea, with VF-151 embarked, operated on station off the coast of Korea following the capture of USS Pueblo (AGER-2) by North Korea. The squadron deployed again in Sep 1968 with Carrier Air Wing 15 (CVW-15) aboard Coral Sea again following a short turn-around period. 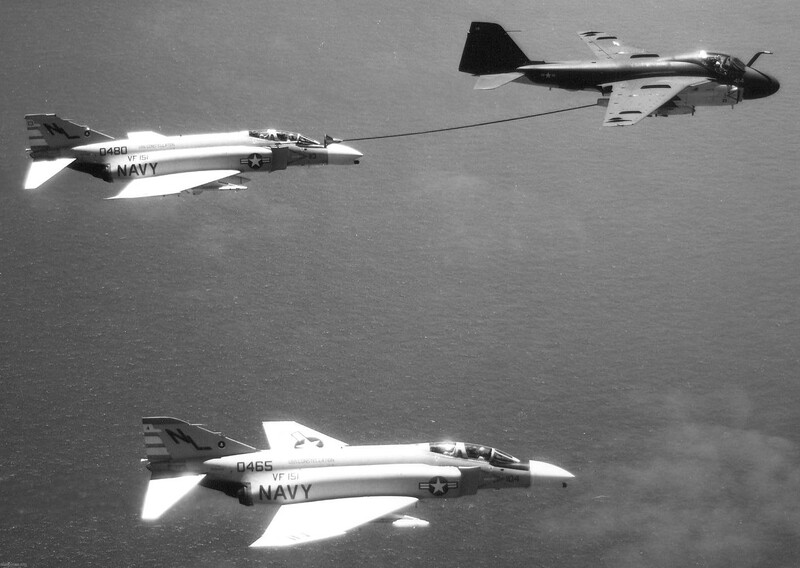 The squadron made its fifth combat deployment of the war in September 1969 aboard Coral Sea and flew more than 2100 combat sorties, more than any other Navy squadron in FY1970. The squadron deployed on its sixth combat cruise of the war in April 1971 with Carrier Air Wing 5 (CVW-5) aboard Midway, flying 1012 combat sorties. In April 1972, the squadron deployed on its seventh and final deployment of the Vietnam War. 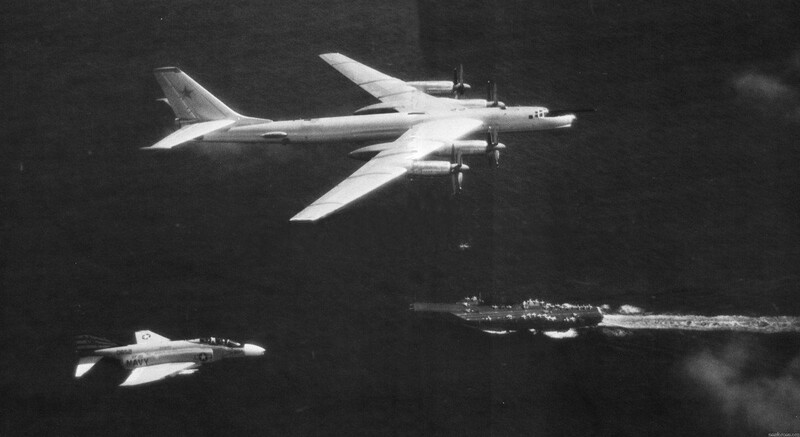 During this deployment, the squadron spent 205 continuous days in combat flight operations, including support of Operation Linebacker I, the bombing campaign designed to disrupt supplies to the North Vietnamese. The squadron's 205 days of continuous combat flight operations was the longest period of combat flight operations in the history of the Vietnam conflict. From 1965 to 1973, the Vigilantes participated in every major operation of the Vietnam War. The Vigilantes made more combat deployments (7) and spent more time on the line (927 days) than any other carrier based unit - including the longest deployment of the Vietnam War (331 days on USS Coral Sea) and the longest line period of the Vietnam War (208 days on USS Midway). 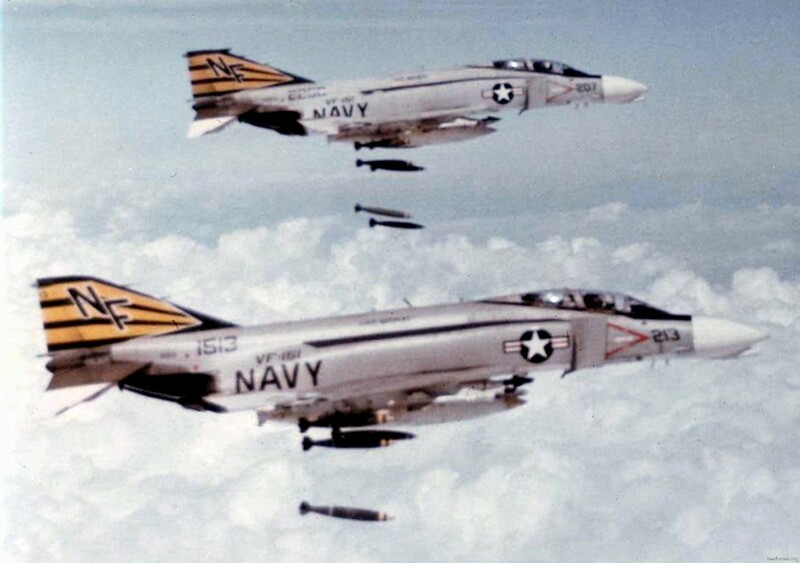 The Vigilantes returned to San Francisco, California from Vietnam in March 1973 and transitioned to the F-4N variant of the Phantom. On 11 September 1973, USS Midway with VF-151 aboard, departed the US for the last time for many years to come. The ship arrived at its new port of United States Fleet Activities Yokosuka, Japan and the squadron at its new home of NAF Atsugi, Japan on 5 October. The ship was met by a group of Japanese demonstrators, railing against the home porting of a US “Man-of-War” in Japanese waters. for what would ultimately be called Operation Frequent Wind or the evacuation of Saigon as the country fell to the communists. The ship took aboard Marine helicopters as it passed Okinawa and offloaded them when in the vicinity of Cubi Point in the Philippines. The ship then headed for the coast of Vietnam and the squadrons flew Combat Air Patrols in support of “Buffalo Hunter” missions as the North Vietnamese moved quickly South through South Viet Nam. In Aug-Sep 1976, the squadron conducted flight operations near the Korean Peninsula following the murder of U.S. military personnel in the Korean DMZ by North Koreans. In Aug 1977, the squadron transitioned to the F-4J variant of the Phantom. In 1978 the squadron was named the top TACAIR squadron in CVW-5 and received the Chief of Naval Operations Safety "S" award. The squadron made three Indian Ocean deployments between 1979 and 1980. During the 1979 Midway, with VF-151 embarked, deployed to the Gulf of Aden following the outbreak of fighting between North and South Yemen and the fall of the Shah of Iran. 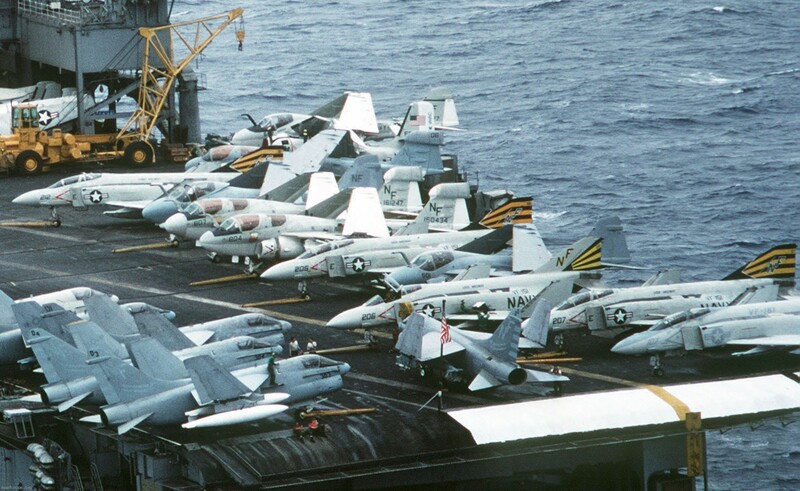 During the 1980 deployment following the Iranian seizure of the American Embassy in Teheran, Midway, with VF- 151 embarked, proceeded to the Gulf of Oman and remained on station until relieved in early February 1980. In Dec 1980, the Vigies transitioned to the F-4S variant of the Phantom. On March 24, 1986, the squadron flew off USS Midway for the last time as VF-151. 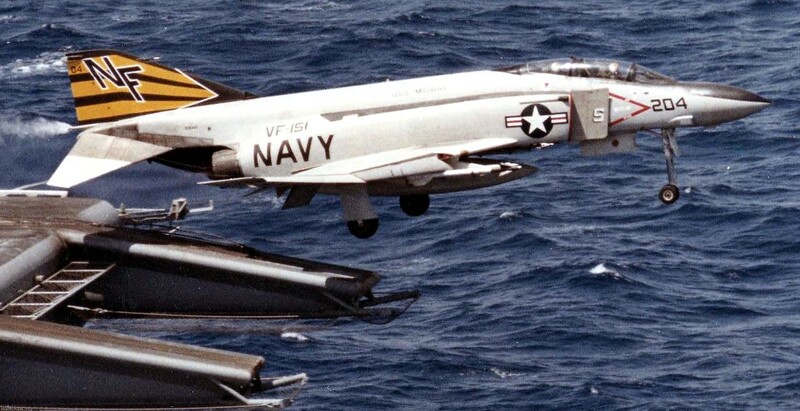 This event also marked the end of an era, as it was the last flight of the F-4 Phantom II from the deck of an aircraft carrier. The squadron reported to NAS Lemoore, California for transition to the new F/A-18 Hornet. VF-151 was one of only two F-4 fighter squadrons to transition to the F/A-18 and be re-designated a strike fighter squadron. 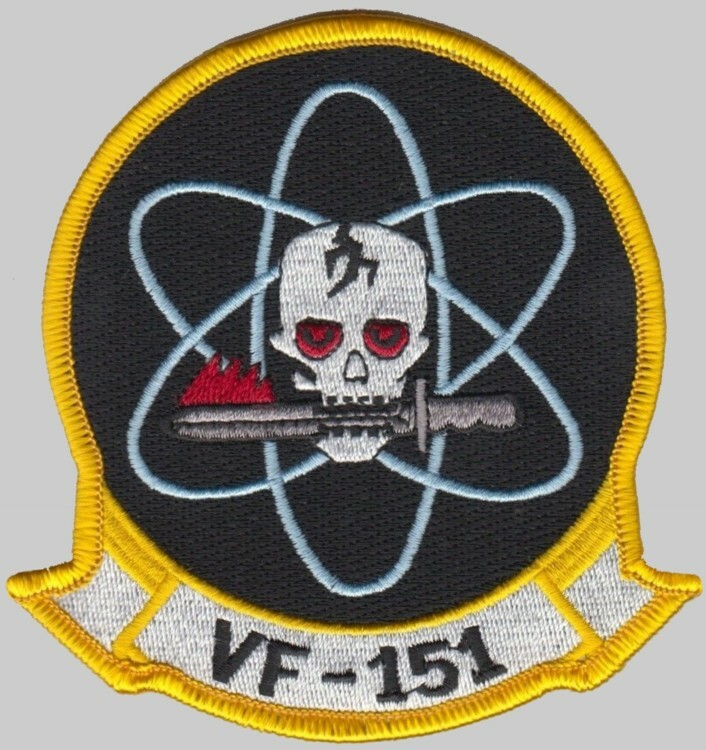 The squadron was redesignated Strike Fighter Squadron 151 (VFA-151) on June 1, 1986. In November of that year, the squadron returned to USS Midway and NAF Atsugi. The squadron’s first insignia was approved by CNO on 9 August 1949. Colors for the knight and shield insignia were: large white shield outlined in black; blue helmet outlined in black with red gems; fuchsia cloak; purple outer garment with a green band around the waist and over the shoulder, silver chain mail; brown boots and straps; blue small shield outlined in black, inside the shield was anouter circle of white and a center of green; red lightning bolt; gold sword outlined in black with red gems. A new insignia was approved by CNO on 26 May 1955. 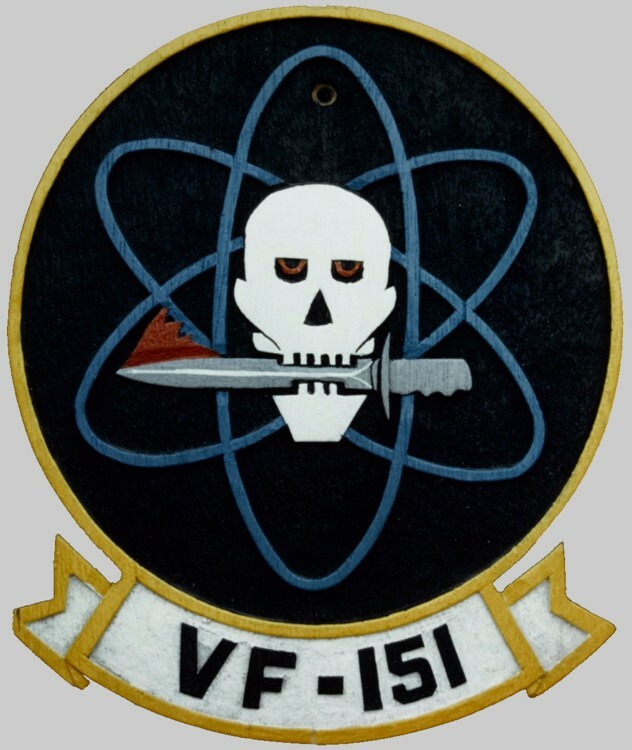 Colors for the skull insignia are: a black background outlined in yellow; white skull with black teeth and markings; red and black eyes; blue electron rings; gray sword with a red flame at the tip; white scroll with black lettering. 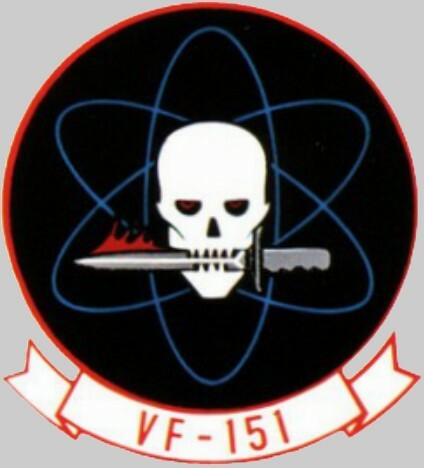 The squadron continued to use this insignia following its redesignation toVF-151 and VFA-151. The squadron flew combat missions in support of the amphibious landings at Inchon, Korea. Squadron aircraft participated in joint operations with the U.S. Air Force, striking targets in Pyongyang and the surrounding area. The squadron was deployed to the western Pacific aboard USS Essex (CVA 9) when the carrier was ordered to operate off the coast of Vietnam during theViet Minh’s assault against the French at Dien Bien Phu. The squadron flew sorties in theTaiwan Straits after the Chinese Communists bombarded Quemoy Island. USS Coral Sea (CVA 43), with VF-151 embarked, operated in the South China Sea after Pathet Lao forces captured strategic positions in Laos. The squadron participated in Rolling Thunder operations, the systematic bombing of military targets in North Vietnam. The squadron’s commanding officer, Commander C. R. Gillespie and his RIO Lieutenant (jg)R. C. Clark, were shot down by a surface-to-air missile while on a mission over North Vietnam. Commander Gillespie became a POW and was released on 14 March 1973, his RIO died in captivity. USS Coral Sea, with VF-151 embarked, operated on station off the coast of Korea following the capture of USS Pueblo (AGER 2) in January by North Korea. The squadron participated inLinebacker I operations, heavy air strikes against targets in North Vietnam to interdict the flow of suppliesand to reduce North Vietnam’s ability to continue the war effort in South Vietnam. Squadron aircraft participated in Operation Frequent Wind, the evacuation of American personnel from Saigon, South Vietnam, as the country fell to the communists. Embarked on USS Midway (CV 41), the squadron conducted flight operations near the Korean Peninsula following the murder of U.S. military personnel in the Korean DMZ by North Koreans. USS Midway, with VF-151 embarked deployed to the Gulf of Aden to relieve USS Constellation (CV 64) and maintain a U.S. carrier presence following the outbreak of fighting between North and South Yemen and the fall of the Shah of Iran. Following the Iranian seizure of the American Embassy in Teheran and the taking of American hostages on 4 November, Midway, with VF-151 embarked, proceeded to the Gulf of Oman andremained on station until relieved in early February1980. USS Midway, with VF-151 embarked, operated off the coast of Korea due to the civil unrest in South Korea and the massacre of several hundred people in the town of Kwangju. Following tensions in Korea, the squadron operated from USS Midway off the coast of Korea until the tensions subsided. VF-151 temporarily relocated to NAS Lemoore for transition training in the F/A-18 Hornet. The squadron’s new Hornets were flown to Japan between 18-21 November. VF-151 was one of only two F-4 fighter squadrons to transition to the F/A-18 and be redesignated a strike fighter squadron. (VF-151, along with CVW-5 and USS Midway (CVA 41), were part of a program to permanently assign a carrier and air wing to an overseas home port. Midway’s new home port was Naval Station Yokosuka, Japan. The squadron would normally operate out of NAF Atsugi or Misawa when the carrier was in port NS Yokosuka. The assignment was effective 30 June 1973. However, the squadron did not arrive until 5 October 1973.